Description: Terrestrial herb, 10–35 cm high. Leaf to c. 30 cm long. Inflorescence 10–20-flowered, sparse. Flowers pallid green, fragrant. Dorsal sepal ovate to lanceolate, 5–7 mm long, apex acute, often recurved, upper surface ± concave; ± at right angles to ovary. Lateral sepals free, lanceolate but with margins inrolled and appearing narrow, 6–8 mm long, subulate, rarely 2-toothed, spreading in same plane as ovary but divergent. Lateral petals narrow-oblong or lanceolate, c. 5 mm long, ± acute, margins pale, centre slightly ridged, spreading or incurved. 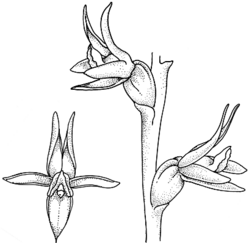 Labellum sessile, ovate, 6–8 mm long, white, often tinted pink, recurved, pubescent with incurved ciliate margins. Flowering: September–November; flowering more regularly following fires or mowing. Distribution and occurrence: Grows in heath and open woodland, on fertile soils; possibly in the far south coast, reported from Green Cape.